How and Where to Buy Combivent Inhaler Online? If you’re wondering if you can place your order for the Combivent Inhaler online, you’re in luck. As long as you have a valid prescription from your doctor, you can fill your prescription here on www.CanadianPharmacyWorld.com and click on How To Order. If a phone call is more your thing, or if you have questions before placing your order, call 1-866-485-7979 and we’d be happy to assist you. Are there Alternative Names for the Brand and Generic Combivent Inhaler? Combivent Inhaler is the brand name drug manufactured by Boehrigner Ingelheim in Canada. The generic Ipratropium/Albuterol is also called Duolin comes from India manufactured by Cipla. We also stock generic Combivent inhaler from New Zealand and other countries. What Dosages and Forms is Combivent Inhaler available in? We carry both the brand name inhaler and its generic equivalent. 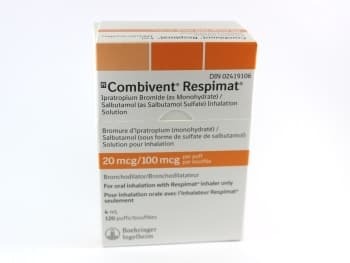 The Combivent Inhaler is available in the 20 mcg/100 mcg/ 4ml (120 puff) dosage at Canadian Pharmacy World. We also have the Ipratropium/Albuterol generic inhaler in the 20 mcg/100 mcg/200 dose and the 20 mcg/50 mcg/200 dose. What is Combivent Inhaler used for? Combivent is a combination albuterol-ipratropium metered-dose inhaler meant to prevent bronchospasm in people suffering from chronic obstructive pulmonary disease (COPD). The combination of albuterol-ipratropium relaxes muscles in the airways and increase airflow to the lungs. This is a bronchodilator used in conjunction with other medicines to control COPD and its symptoms. What are the Possible Side Effects of Combivent Inhaler? Most medications will come with side effects. Before deciding if Combivent Inhaler is right for you, take a closer look at what you might expect. Are there any Precautions and Drug interactions of Combivent Inhaler? You should not use the Combivent Inhaler if you’re allergic to atropine, ipratropium or albuterol. Be sure to talk to your doctor if you are using the above medication, and those you start or stop while on Combivent Inhaler. Store Combivent Inhaler at room temperature away from extreme heat and moisture. Extreme heat can cause the canister to explode, so don’t store it in your car on hot days. Do not throw canister into an open flame. It’s not currently known whether or not this medication may harm a pregnancy or pass into breastmilk. Talk with your doctor if you are pregnant, thinking of becoming pregnant, or nursing. If Combivent gets into your eyes, rinse with water immediately and see medical attention. This medication can cause blurred vision, or impair your thinking and reaction speeds. Be cautious with driving or using heavy machinery until you know how Combivent affects you. An overdose of Combivent can be fatal. Overdose symptoms include: chest pain, fast or pounding heartbeats, extreme thirst, muscle weakness or limpness, severe headache, buzzing in the ears, weak pulse, fainting, slow or stopped breathing. Seek emergency help or call Poison Control at 1-800-463-5060 immediately if you suspect an overdose.